Habit at Calico Hills second pullout Red Rocks, Nevada. December 21, 2007. 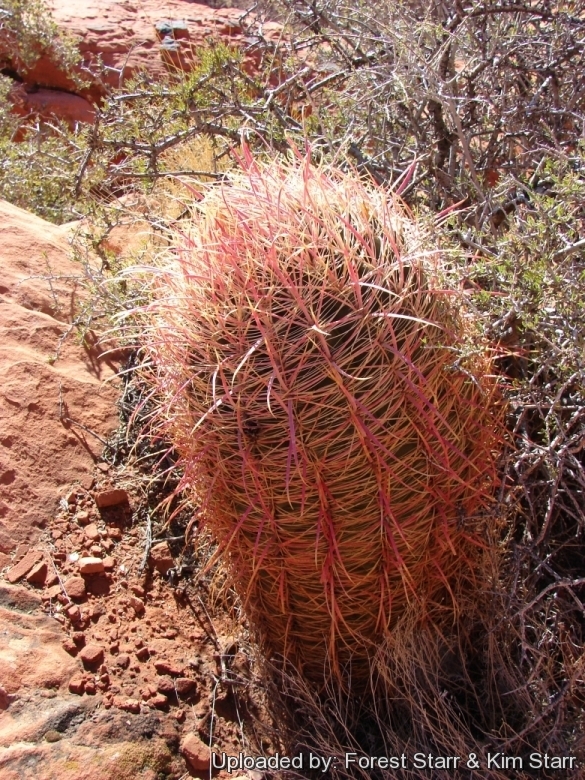 Origin and Habitat: The various variety of Ferocactus cylindraceus (= Ferocactus acanthodes) are spread in the southern of United States (central and western Arizona, southeastern California Nevada, and Utah) and southwards into Mexico (Baja California and Sonora) . Altitude range: From sea level to 1750 metres. 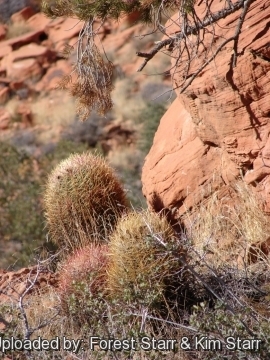 Habitat: This cactus is locally abundant in arid gravelly or rocky foothills, canyon walls, fans and wash margins, sometimes on the plains among creosote bush scrub, it also utilizes slopes and acid igneous rock lands. The species is limited in its northwards range by frost conditions. To reduce the damage by frost the plant is found on south facing slopes and it leans to the south to protect the sensitive growing tip by placing it for best exposure to the sun. The dense shading of the growing tip by spines, fruit, flowers remnants and pubescence allow this species a further northward range and higher elevations than Ferocactus wislizenii or Ferocactus covillei. Ferocactus cylindraceus is widespread and abundant, grows mostly in rocky areas, with little threat with no evidence of directional population trend. In some coastal areas tourist development is an issue. 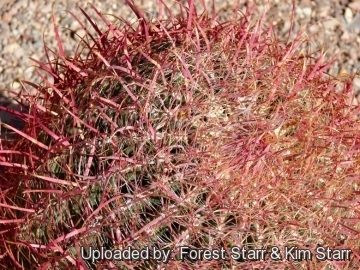 Description: Ferocactus cylindraceus = (Ferocactus acanthodes) is a colourful barrel cactus usually unbranched, forming a single moderately tall column. Four subspecies are recognized, the nominate form, subsp. eastwoodiae (L.D.Benson) N.P.Taylor, subsp. lecontei (Engelm.) N.P.Taylor and subsp. tortulispinus (Gates) N.P.Taylor. Stem: Green, spherical becoming columnar up to 2 m tall and 30 cm in diameter. Central spines: A large central spine and three auxiliary centrals form a crucifix shape. The primary central is 7-15 long, angles down and is slightly to moderately hooked, sometimes to 90 degrees. The other centrals are from 5 to 7,5 cm long. The centrals are noticeably ring ridged and flattened, with a flat upper surface and rounded lower surface. Spines can be very light grey to red and yellow, but darken to black with age. 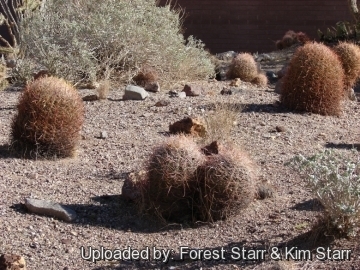 1)Forest & Kim Starr Ferocactus cylindraceus (Barrel cactus). Plants of Hawaii. <http://www.starrenvironmental.com>. Downloaded on 22 August 2014. 8) Burquez Montijo, A. & Felger, R.S. 2013. 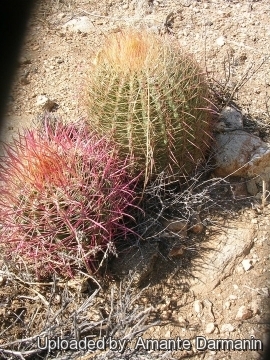 Ferocactus cylindraceus. The IUCN Red List of Threatened Species. Version 2014.2. <www.iucnredlist.org>. Downloaded on 24 August 2014. 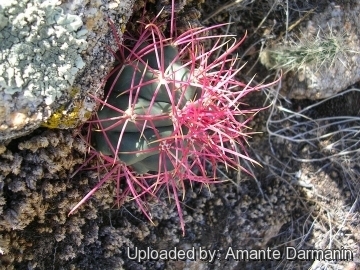 Cultivation and Propagation: Ferocactus cylindraceus are summer-growing and pretty easy plants. Use and Trade: In the past the Seris indian used to eat the seeds. There is a minor fruit use.